The White Album Project | A Comprehensive Look at the Beatles Self-titled Double-album Masterpiece. On one hand, The Beatles (aka the White Album) is the most diverse record that the Beatles, or probably any pop band in history, has ever made. 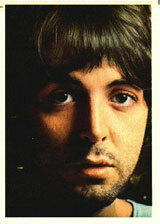 On the other, as Paul McCartney recalled, “That was the tension album. We were all in the midst of that psychedelic thing, or just coming out of it. In any case, it was weird. Never before had we recorded with beds in the studio and people visiting for hours on end: business meetings and all that. There was a lot of friction during that album. 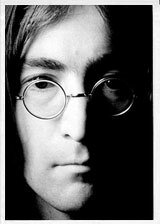 We were just about to break up, and that was tense in itself.” Lester Bangs described it perfectly: “The first album by The Beatles or in the history of rock by four solo artist in one band.” In saying that Bangs was simply following John Lennon’s lead. Almost five months in the making, nearly 94 minutes in length, it had no graphics or text other than the band’s name embossed on its plain white sleeve. 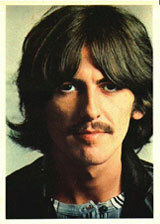 The White Album was their ninth official British album release, and fifteenth American album. It was also the first full album project the group undertook following the death of their manager, Brian Epstein, in August of the previous year. It went on to become their best selling album ever, certified at over 20 million units by the RIAA. The White Album’s original working title was A Doll’s House, which is the name of Henrik Ibsen’s masterpiece 19th century play. 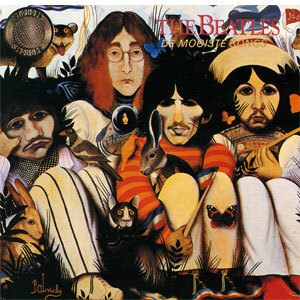 In addition, according to Geoffrey Giuliano, author of The Beatles Album, an illustration was prepared for the cover of A Doll’s House by the famed artist John Byrne (aka Patrick). However the title was changed when the British progressive band Family released the similarly titled Music in a Doll’s House earlier that year. The plain white cover was opted for instead after McCartney then requested that the album’s sleeve design “be as stark a contrast to Peter Blake’s vivid cover art for Sgt. 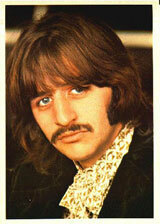 Pepper’s Lonely Hearts Club Band as possible, the complete opposite of it….” That’s exactly what he got. The scope and license of the White Album has permitted everyone from OutKast to Radiohead to Green Day to Joanna Newsom to roll their picture out on a broader, bolder canvas. The search for hidden meanings within the songs reached its low point when cult leader Charles Manson used the record to persuade members of his “family” that the album was in fact an apocalyptic message predicting a prolonged race war and justifying the murder of wealthy people. The album’s association with a high-profile mass murder was one of many factors that helped to deepen the accelerating divide between those who were profoundly skeptical of the “youth culture” movement unfolding in the mid to late 60s in the U.K., the U.S., and elsewhere, and those who admired its openness and spontaneity. Prosecutor Vincent Bugliosi wrote a best-selling book about the Manson “family” that explicated, among other things, the cult’s fixation with identifying hidden messages within The Beatles album. 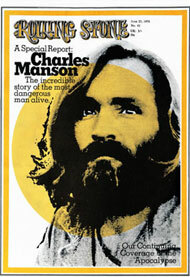 Bugliosi’s book was entitled Helter Skelter, the term Manson took from the album’s song title and construed as the impending conflict he believed was fast approaching. Cultural responses to the album persisted for decades, and even offer a glimpse into the process of collective myth-making. 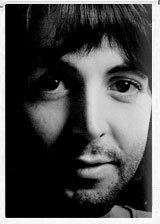 In October 1969, a Detroit radio program began to promote theories based on “clues” supposedly left on The Beatles and other Beatles albums suggesting that Paul McCartney had died and been replaced by a lookalike. The ensuing hunt for such clues to a supposed cover-up that the Beatles presumably wanted to suppress (and simultaneously publicize) has become a classic example of the development and persistence of urban legends. It was their first studio album in almost eighteen months and, coming as it did after the blockbuster success of Sgt. 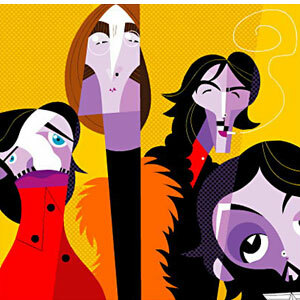 Pepper’s Lonely Hearts Club Band, expectations were high at time of release of The Beatles. At its debut in the U.K. on December 1, 1968, the album went straight to #1, becoming their third album to do so (the first two being Help! and Revolver). It spent seven weeks at the top of the U.K. charts, including the entire competitive Christmas season, until it was replaced by the Seekers’ Best of the Seekers on January 25, 1969, dropping to #2. However, the album returned to the top spot the next week, spending an eighth and final week at #1. 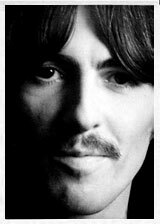 The White Album was particularly notable for blocking the Beatles follow-up album, Yellow Submarine, which debuted (and peaked at) #3 on February 8, 1969, the same week The White Album was dominating the second position on the charts. It then spent another four weeks in the Top 10 before dropping down the charts. 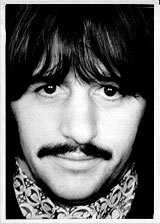 In all, “The Beatles” spent 24 weeks on the UK charts (a far cry comparison to the over 200 weeks spent by Sgt. Pepper’s). In the United States, the album was received with huge commercial success. It debuted at #11, then reached #2, and finally peaked at #1 in its third week, spending a total of nine weeks at the top. In all, The Beatles spent 155 weeks on the Billboard 200. According to the Recording Industry Association of America, The Beatles is The Beatles’ best-selling album at 19-times platinum and the tenth-best-selling album of all time in the United States. Although it carried a list price of $11.79 (a single album was selling for $3.98), their double album “The Beatles” sold 4 million units during its first four weeks alone; a record for any double album up to that time. The Beatles was the last Beatles album to be released with a unique, alternate mono mix, albeit one issued only in the UK. 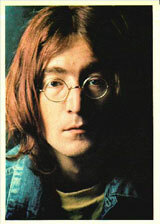 Twenty-eight of the album’s 30 tracks (“Revolution 1″ and “Revolution 9″ being the only exceptions) exist in official alternate mono mixes. Beatles’ albums after The White Album (except Yellow Submarine in the UK) occasionally had mono pressings in certain countries (such as Brazil), but these editions—Yellow Submarine, Abbey Road and Let It Be—were in each case mono fold-downs from the regular stereo mixes. 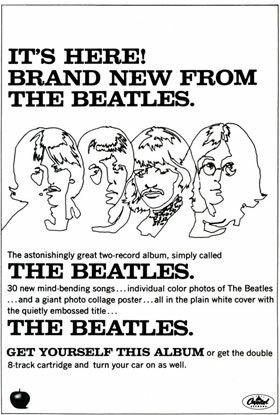 By 1968 in the U.S., mono records were already being phased out; the U.S. release of The Beatles was the first Beatles LP to be issued in the U.S. in stereo only. The album’s cover, though stark and minimalistic, has been highly influential. Goth band The Damned released The Black Album in 1980, and is considered the first album to draw influence from the cover, as well as the first band to use the term “Black Album”. The 1984 Rob Reiner “rockumentary” This Is Spinal Tap also pays homage with their own “Black Album”, which is juxtaposed to the original by A&R staff Bobbi Fleckman, who notes in a debate about appropriate packaging material: “What about the White album? There was nothing on that Goddamned cover.” The band are generally less enthusiastic, referring to it variously as “a black mirror”, “none more black” and “death”. The self-titled debut album of They Might Be Giants is commonly referred to as “The Pink Album” due to the amount of the color pink on the cover. Comedian Dennis Miller released a stand-up comedy recording in October 1988 titled “The Off-White Album” which mimicked the design of The Beatles. In the 1990s, both Prince and Metallica released self-titled albums with their names printed against mostly plain black covers, and are both informally referred to as “The Black Album”. In 2003, rapper Jay-Z released an album officially called The Black Album. DJ Danger Mouse produced the mashup The Grey Album by combining vocals from Jay-Z’s Black Album with samples from The Beatles. Two compilations of Beatles’ material, released in 1973 as 1962–1966 and 1967–1970, are often referred to as “The Red Album” and “The Blue Album” respectively, in reference to their colour scheme. The Bob and Tom Show named their first collection of material as The White Cassette (later renamed The White Album when released on CD). All three of Weezer’s self-titled albums borrow from this idea as well and fans refer to them respectively as “The Blue Album” (1994), “The Green Album” (2001), and “The Red Album” (2008). The 311’s self-titled release from 1995 is often referred to as “The Blue Album”, and The Dells’ 1973 self-titled album is often known as “The Brown Album”, as is The Band’s 1969 self-titled album. Australian comedy duo Martin/Molloy also released a CD called The Brown Album in 1995, while American rock band Primus did likewise in 1997. 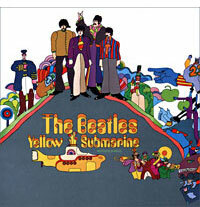 The animated television series The Simpsons and SpongeBob Squarepants both used the title The Yellow Album for their spin-off CDs, with the latter also parodying the plain cover. The British electronica duo Orbital released their first two albums without definite names, which in time became known as The Green Album and The Brown Album, while their final release is known as The Blue Album. The satirical Australian alternative rock band TISM released The White Albun [sic] in 2004. The band Phish covered the album in its entirety for their second set of their three set Halloween show in ‘94.